Once a small yet busy railroad stop, this historic living ghost town is now home to the headquarters of Ted Turner’s Armandaris ranch, a church, a handful of houses and sits on the Northern Access Road to Spaceport America. Engle began in 1879 as a stop on the Atchison Topeka Santa Fe Railroad where it was a crucial shipping point for miners and prospectors and served as a water stop. It thrived for a few years as a setting off point and supply base for miners and prospectors. It housed hotels, a general store and saloons. When mining dried up in the area circa 1883 the town saw a decline until ranchers to the east began driving cattles across the plains in 1896, sometimes as many as 17,000 head of cattle. At that time the railroad stop became an important point for shipping cattle and it was a popular place for cowboys to rest and enjoy some recreation at the saloons. Shortly after the turn of the century nearby ranches suffered from overgrazing and drought, which in turn dried up the towns commerce. However the building of the nearby Elephant Butte Dam between 1911 and 1916 saw a big revival with the towns population peaking at around 500. From 1920, with construction of the dam well completed, the town once again struggled to survive and by the late 1920’s the population was just 75. In 1930 a road was graded from Tularosa to Engle, briefly raising hopes of some kind of revival, however in 1945 the US Government made the land east of Engle into what is now White Sands Missile Range for the purpose of testing the Atomic Bomb. This effectively left Engle at the end of a road that didn’t really lead anywhere. By 1955 the Post Office was closed and now just a few structures remain. 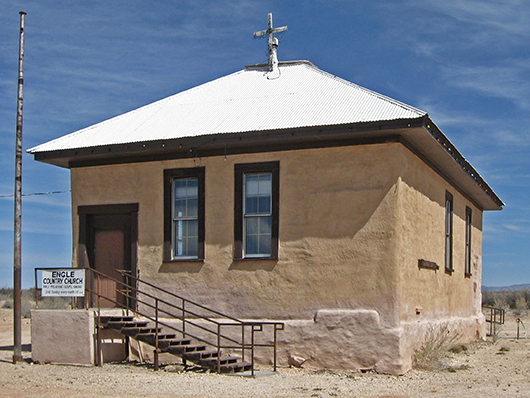 One of those is an adobe schoolhouse, now used as a church that was constructed in 1909. Today Engle is the headquarters of Ted Turner’s Armandaris Ranch and sometimes Bison can be seen nearby. It also is one of the few places you can enjoy uninterrupted views of the historic Jornada del Muerto and is set to get a lot busier when spaceflight operations commence from Spaceport America. The road from Truth or Consequences was paved in 2007 in preparation for construction at the spaceport. IMPORTANT: The nearest gas, food and accommodation services are located approximately 17 miles from Engle in either Truth or Consequences or Elephant Butte. The road beyond Engle from Spaceport America towards I-25 to the South is unpaved and should only be attempted by 4WD vehicles.